Ever want to let someone else make the pizza for a change? Yeah, me too. Sure, there are times when I lay awake plotting what to put on a pizza. But there are also times that I just don't feel like making the effort. 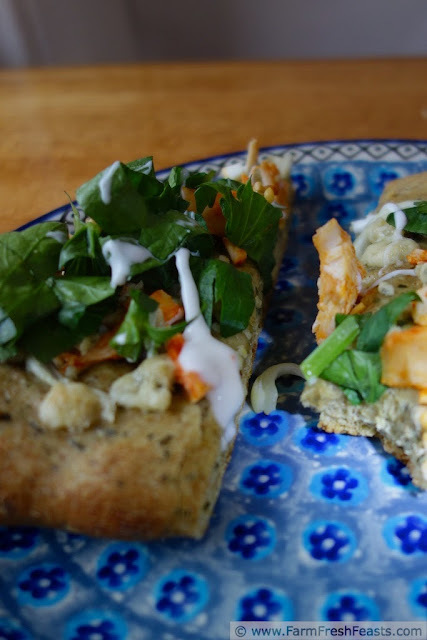 I happened upon a Buffalo Chicken Pizza at the grocery store (marked down!) during one of those times, and the flavor was a big hit with the males of the family. Well, the intact males--Simon the pup and Quartz the composting guinea pig did not sample the pizza. TMI? One of the reasons I'm delighted that my son enjoys Buffalo Chicken is that he consumes celery when he eats it. Since I'm like the simple dog about my regrown celery ("Look! I made FOOD!") 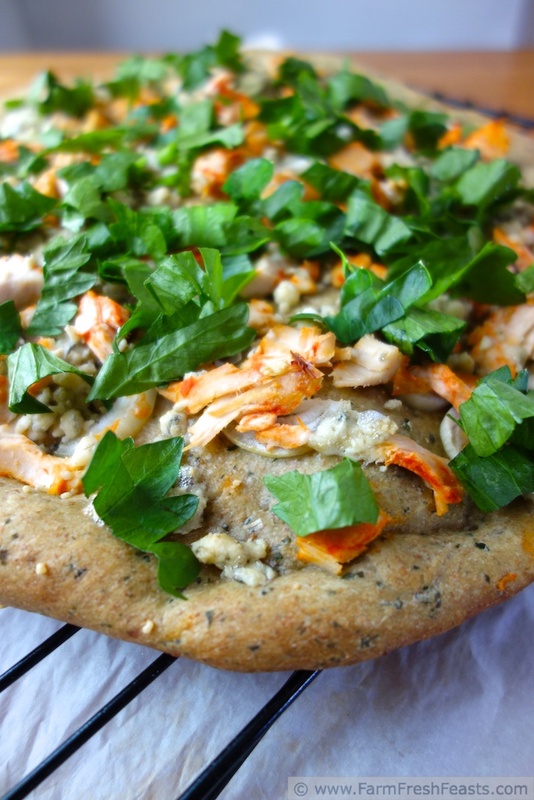 I planned to scatter freshly chopped celery leaves over top of any Buffalo chicken pizza I'd ever make. I knew the leaves would a) look pretty and b) use some of the celery taking over the garden make the taste more authentic. When I decided to make Wheatier Buttermilk Pesto Pizza dough after my success with plain buttermilk dough I was thinking that it would be a good base for Buffalo chicken topping--after all, buttermilk + herbs is close to ranch dressing, amIright? I got a little frou frou with the post production of this pizza (that would be after I pulled it out of the oven, not in Adobe Photoshop Lightroom Nothing). My dribbling skills have improved ever so slightly, and I was please not only with the taste but also with the look of this pizza. Even if you're not The Little Red Hen who grows her own celery and can pop out to harvest the leaves, try this one at home. When you feel up to it, that is. It's delicious. 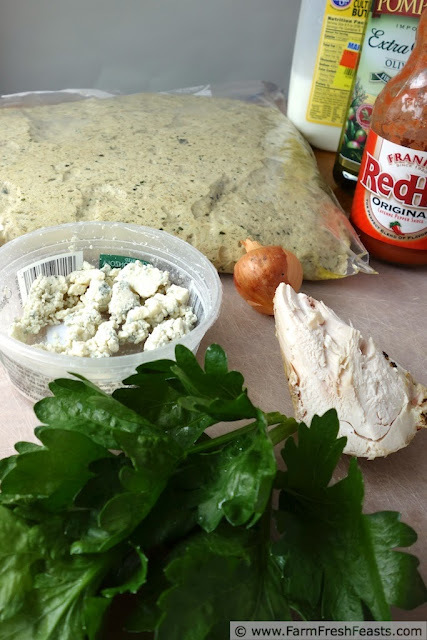 If you've never made pizza dough at home, please refer to my Pizza Primer for photo collages, hints, and tips to make your endeavors successful. It's really fun--and easy once you get the hang of it! Place buttermilk, pesto, and yeast in the bowl of a stand mixer, and allow to hang out together and dissolve while you're getting the rest of the ingredients together. I do pour the buttermilk straight from the fridge, without warming it up, because I figure I'm not really asking the yeast to go bonkers just yet, so if the dough is a little chilly it's OK by me. Add the rest of the ingredients (love my kitchen scale!) and mix with the paddle slowly for a few minutes. Stop and scrape the sides, then mix at a higher speed for a few minutes. Check and see that the dough is forming a ball around the paddle and pulling away from the sides of the bowl. If it's too dry, add a teaspoon of olive oil. Turn down the speed to medium-low and continue mixing a few more minutes. Transfer to an oiled bag or bowl and refrigerate until you're ready to use it. You can also freeze this dough if you're not going to be using it within a week--if so, please label the bag so you know what kind it is. Trust me. On the day of baking, set the dough out on the counter about 2 hours before you're ready to bake. An hour before you're ready to bake, preheat your oven to 425 degrees Fahrenheit with a pizza stone inside (yes, I wrote a poem to my pizza stone). If you don't have one, use a cookie sheet until you can hit a thrift shop up and snag one. If you want--no pressure. On an oiled piece of parchment paper, stretch out dough in a pleasing shape. Brush with olive oil. Set aside. Squirt the Frank's Red Hot® sauce over the chicken and mix well. 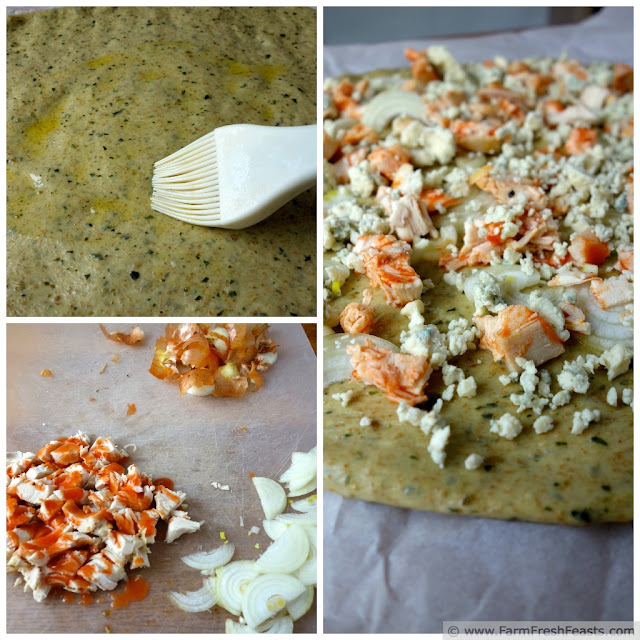 Scatter chicken and onions evenly across dough. Bake in a 425 degree Fahrenheit preheated oven for 5-8 minutes. Shimmy the crust off the parchment, and continue to bake on the bare stone or cookie sheet for another 3-5 minutes. Remove from oven and place on a cooling rack. Scatter celery leaves over top, and if you're in the mood, drizzle ranch dressing over the celery leaves. Slice and serve. This pizza is shared with the From The Farm Blog Hop, the Clever Chicks Blog Hop, Tasty Tuesdays, Mostly Homemade Mondays, What's In The Box, What's Cookin' Wednesday, and the Wednesday Fresh Foods Link Up Pot Luck Party. I don't grow celery, but I do have one lovage plant in my garden that refuses to quit. The leaves taste very similar, and I think they'd work quite well in the Buffalo chicken combo. Thank you for teaching me about lovage--I will be prepared should it ever appear in my farm share. Sorrel was stumper from my first ever CSA season in 2006, and while I'm ready to attack that I haven't gotten it in a farm share since. Always good to be prepared, though. I eat very little meat unless it is quite spicy - like sausage and chili and buffalo chicken. This pizza would be a hit in my home. The great thing about spicy meat is that a little adds a huge burst of flavor, and goes a long way. You make me laugh, which is a very good thing. I love your pizza, even when you don't feel like making it, and I totally understand your I made FOOD excitement. This weekend, I harvested onions I planted two years ago and had already decided they couldn't possible be any good. I also checked out my pepper plant, and I'm growing purple peppers (technically Chinese 5 Peppers) and I couldn't be more excited. Squeals with delight. Pics or it didn't happen . . . I love buffalo chicken, well anything, but definitely pizza! I haven't had it in so long, I should probably correct that soon! Thanks for posting. Yes, you should correct that soon. I'll take another piece, too! Love the look of the pizza with the celery leaves on top! I might like celery leaves more than raw celery. I think they taste like cooked celery, which is one of my favorite tastes and aromas! Pizza night later this week might just call for some celery leaves. And I am reminded again that I need to get my celery growing! I had a room mate who would sauté celery and onions while she was deciding what the heck to fix for dinner--the kitchen always smelled so great. Good luck with your celery! I'm so glad I'm not alone in my nocturnal pizza plotting! What a gorgeous pizza! Thanks for linking up with What's Cookin' Wednesday! Thank you for hosting a tremendous link up!